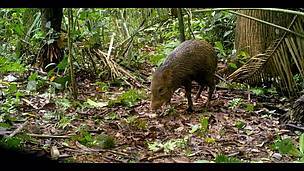 Collared peccaries (Pecari tajacu) and white-lipped peccaries (Tayassu pecari), two species of wild pigs in the Amazon, are the theme of the new video of the series Residents of the Forest. The education-oriented videos provide information about some of the most remarkable and rare species of the Amazonian forests using images captured by camera traps installed in the Extractive Reserve (Resex) Chico Mendes, in the state of Acre (AC). 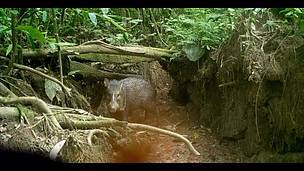 In the Amazon, the two peccary species occur in two types of forests. While white-lipped peccaries are more common in lowland forests, collared peccaries tend to occur more often in dry-land forest areas of the Amazon. Another characteristic of the species is that both are highly sociable. Collared peccaries live in flocks, which vary between six and 30 individuals, while white-lipped peccaries in larger groups that can reach up to 100 animals. "Species like the collared and white-lipped peccaries are essential for a healthy forest because these animals are one of the main sources of food for large carnivores such as jaguars, pumas, and ocelots. These wild cats can only inhabit areas in which there is good availability of prey as these pigs," explains Felipe Spina Avino, a biologist and conservation analyst at WWF-Brazil. Countrywide, Brazil registers three species of wild pigs. Besides the collared and white-lipped peccary, there is also the giant peccary (Pecari maximus). All species are protected by Brazilian law (Law n°. 5.197/1967). The main threats to these animals include the loss and degradation of their habitats and roadkills. The main predators of species are jaguars (Panthera onca), pumas or cougars (Puma concolor), and human beings. Because they are larger animals and live in flocks, they are frequently hunted by humans. Altogether, the series will have 10 videos, one every month, depicting the results of an initiative that installed 20 camera traps within the Resex. The work is unprecedented and has been done in partnership with the community members of the extractive reserve, who have been monitoring the fauna present in the forest management areas of the protected area. Since the launch of the first video, in April 2018, which showed the first record of the pacarana (Dinomys branickii) in Amazonian forests, the series Residents of the Forest also features the following species: the Brazilian tapir (Tapirus terrestris), bush dogs and Amazon anteaters (click on the links to the side to watch the videos). The series is a partnership between WWF-Brazil, the Cooperative of Community Forest Producers (Cooperfloresta) and the Association of Residents and Producers of the Chico Mendes Extractive Reserve in Xapuri (Amoprex). Furthermore, it has support from the Chico Mendes Institute for Biodiversity Conservation (ICMBio) and the board of directors of the Chico Mendes Resex. The goal is to monitor wild species that occur in the Extractive Reserve. The camera traps are regular cameras equipped with technological improvements and appropriate for the wild environment. They are hidden and tied to trees, and work with light sensors. Every time an animal walks past the equipment, the camera automatically shoots and takes a picture or starts an audiovisual recording. Such cameras use infrared recording and provide great results during nighttime without additional light, and do not scare or harass the animals. As a result, conservationists around the globe have increasingly adopted them. The installation took place in workshops that gathered about 20 extractors and four of them were trained to be the “local operators” of the equipment. Since they were installed at the Chico Mendes Resex in December 2017, the cameras have made more than 23,000 records, representing more than 6,500 hours of recording. The cameras have recorded more than 30 different species of animals: armadillos (Dasypus sp. ), brocket deer (Mazama sp. ), guariba monkeys (Alouatta seniculus), robust capuchin monkeys (Cebus apela), ocelots (Leopardus pardalis), and many others. The Chico Mendes Extractive Reserve (Resex) was created in 1990 and has more than 970,000 hectares. It covers seven municipalities in the state of Acre and has about 10,000 inhabitants. The Resex is one of the 117 conservation units supported by the Amazon Protected Areas Program (ARPA).